This tutorial is an intermediate level tutorial. Some basic understanding of the state system and writing Salt Formulas is assumed. 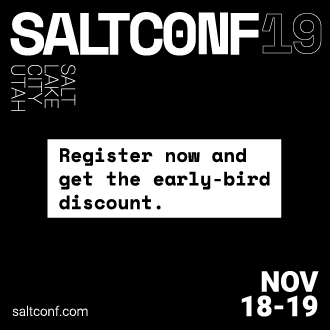 Salt's state system is built to deliver all of the power of configuration management systems without sacrificing simplicity. This tutorial is made to help users understand in detail just how the order is defined for state executions in Salt. This tutorial is written to represent the behavior of Salt as of version 0.17.0. To understand ordering in depth some very basic knowledge about the state compiler is very helpful. No need to worry though, this is very high level! This "High Data" structure is then compiled down to "Low Data". The Low Data is what is matched up to create individual executions in Salt's configuration management system. The low data is an ordered list of single state calls to execute. Once the low data is compiled the evaluation order can be seen. The state execution module contains MANY functions for evaluating the state system and is well worth a read! These routines can be very useful when debugging states or to help deepen one's understanding of Salt's state system. This tutorial discusses the Low Data evaluation and the state runtime. Salt defines 2 order interfaces which are evaluated in the state runtime and defines these orders in a number of passes. The Definition Order system can be disabled by turning the option state_auto_order to False in the master configuration file. The top level of ordering is the Definition Order . The Definition Order is the order in which states are defined in salt formulas. This is very straightforward on basic states which do not contain include statements or a top file, as the states are just ordered from the top of the file, but the include system starts to bring in some simple rules for how the Definition Order is defined. Looking back at the "Low Data" and "High Data" shown above, the order key has been transparently added to the data to enable the Definition Order . Basically, if there is an include statement in a formula, then the formulas which are included will be run BEFORE the contents of the formula which is including them. Also, the include statement is a list, so they will be loaded in the order in which they are included. This order flag will over ride the definition order, this makes it very simple to create states that are always executed first, last or in specific stages, a great example is defining a number of package repositories that need to be set up before anything else, or final checks that need to be run at the end of a state run by using order: last or order: -1. When the order flag is explicitly set the Definition Order system will omit setting an order for that state and directly use the order flag defined. Salt states were written to ALWAYS execute in the same order. Before the introduction of Definition Order in version 0.17.0 everything was ordered lexicographically according to the name of the state, then function then id. This is the way Salt has always ensured that states always run in the same order regardless of where they are deployed, the addition of the Definition Order method mealy makes this finite ordering easier to follow. The lexicographical ordering is still applied but it only has any effect when two order statements collide. This means that if multiple states are assigned the same order number that they will fall back to lexicographical ordering to ensure that every execution still happens in a finite order. If running with state_auto_order: False the order key is not set automatically, since the Lexicographical order can be derived from other keys. Salt states are fully declarative, in that they are written to declare the state in which a system should be. This means that components can require that other components have been set up successfully. Unlike the other ordering systems, the Requisite system in Salt is evaluated at runtime. The requisite system is also built to ensure that the ordering of execution never changes, but is always the same for a given set of states. This is accomplished by using a runtime that processes states in a completely predictable order instead of using an event loop based system like other declarative configuration management systems. The requisite system is evaluated as the components are found, and the requisites are always evaluated in the same order. This explanation will be followed by an example, as the raw explanation may be a little dizzying at first as it creates a linear dependency evaluation sequence. The "Low Data" is an ordered list or dictionaries, the state runtime evaluates each dictionary in the order in which they are arranged in the list. When evaluating a single dictionary it is checked for requisites, requisites are evaluated in order, require then watch then prereq. If using requisite in statements like require_in and watch_in these will be compiled down to require and watch statements before runtime evaluation. Each requisite contains an ordered list of requisites, these requisites are looked up in the list of dictionaries and then executed. Once all requisites have been evaluated and executed then the requiring state can safely be run (or not run if requisites have not been met). This means that the requisites are always evaluated in the same order, again ensuring one of the core design principals of Salt's State system to ensure that execution is always finite is intact. The pkg.installed is executed ensuring that the apache package is installed, it contains no requisites and is therefore the first defined state to execute. The service.running state is evaluated but NOT executed, a watch requisite is found, therefore they are read in order, the runtime first checks for the file, sees that it has not been executed and calls for the file state to be evaluated. The file state is evaluated AND executed, since it, like the pkg state does not contain any requisites. The evaluation of the service state continues, it next checks the pkg requisite and sees that it is met, with all requisites met the service state is now executed. The best practice in Salt is to choose a method and stick with it, official states are written using requisites for all associations since requisites create clean, traceable dependency trails and make for the most portable formulas. To accomplish something similar to how classical imperative systems function all requisites can be omitted and the failhard option then set to True in the master configuration, this will stop all state runs at the first instance of a failure. In the end, using requisites creates very tight and fine grained states, not using requisites makes full sequence runs and while slightly easier to write, and gives much less control over the executions.